The Littlite Anser Dual LED is specifically designed for microscope illumination, and is also an excellent choice for any application requiring strong, even illumination. The two gooseneck LED lights can be positioned to illuminate from multiple sides eliminating shadows. The Littlite Anser Dual LED has two 3-Watt LEDs to provide a warm and consistent light source without generating excessive heat. The compact weighted base with built-in dimmer takes up very little space on your desk or work bench. 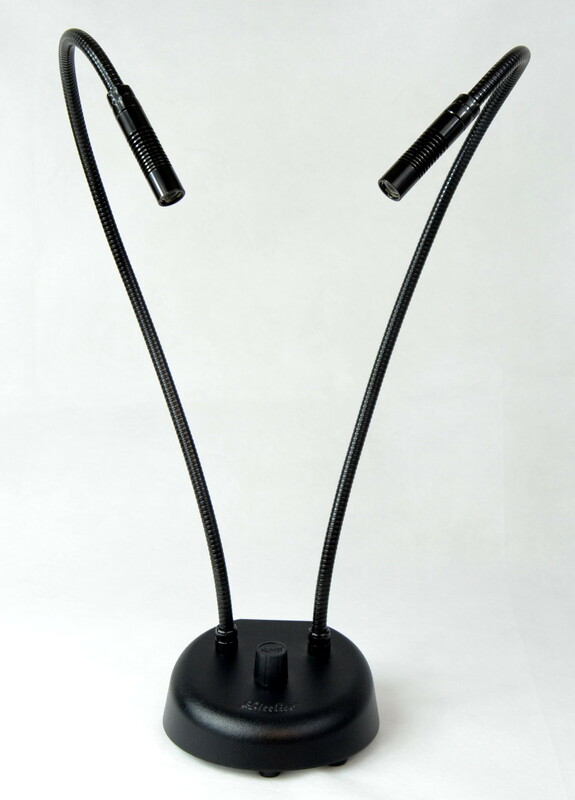 Available in standard output or Spot version with a tighter light output (at 12″ or greater). AN-DL12-LED-3W-DUAL – ANSER DUAL LED Light with built in dimmer and two 12″ goosenecks. AN-DL18-LED-3W-DUAL – ANSER DUAL LED Light with built in dimmer and two 18″ goosenecks. AN-DL12-LED-SPOT-3W-DUAL – ANSER DUAL LED Light Spot version with built in dimmer and two 12″ goosenecks. AN-DL18-LED-SPOT-3W-DUAL – ANSER DUAL LED Light Spot version with built in dimmer and two 18″ goosenecks.